Using Hubble Space Telescope, astronomers have discovered a star never-seen-before in our galaxy or anywhere else in the universe, a star so weird that it was called “Nasty 1“. This extremely bright star is surrounded by a huge, pancake-shaped disk of gas nearly 3 trillion miles (4.8 trillion kilometers) wide and lies about 3,000 light-years away from Earth. Nasty 1 has been known for decades — also known as Wolf-Rayet 122, one of a class known as Wolf-Rayet stars — a rapidly aging star which is more massive than our sun, over 10 times the sun’ mass. The star loses it’s hydrogen-filled outer layers, exposing the objects’ helium-burning cores to space. However, Nasty 1 is not look like a typical Wolf-Rayet star. Scientists have been expecting to see twin lobes of gas flowing from opposite sides of the star — typical Wolf-Rayet behavior — but instead they have detected a pancake-shaped disc of gas encircling the star. 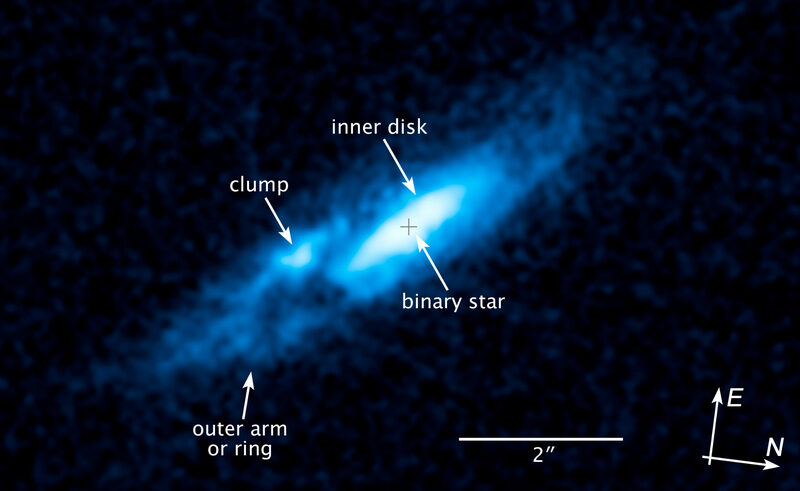 We were excited to see this disk-like structure because it may be evidence for a Wolf-Rayet star forming from a binary interaction. There are very few examples in the galaxy of this process in action because this phase is short-lived, perhaps lasting only a hundred thousand years, while the timescale over which a resulting disk is visible could be only ten thousand years or less. Said Dr. Jon Mauerhan ~ lead author of the paper published in the Monthly Notices of the Royal Astronomical Society. Scientists have debated just how a Wolf-Rayet star forms; one scenario suggests that as these massive stars evolve, the outer hydrogen envelope, which is loosely bound, becomes vulnerable to gravitational stripping, or a type of stellar cannibalism, by a nearby companion star. In that process, the more compact companion star winds up gaining mass, and the original massive star loses its hydrogen envelope, exposing its helium core to become a Wolf-Rayet star. Nasty 1 and a possible companion. ©NASA, ESA, and J. Mauerhan (University of California, Berkeley). That’s what we think is happening in Nasty 1. Said Mauerhan in a statement. We think there is a Wolf-Rayet star buried inside the nebula, and we think the nebula is being created by this mass-transfer process. So this type of sloppy stellar cannibalism actually makes Nasty 1 a rather fitting nickname. Another way Wolf-Rayet stars are said to form as a massive star throws off its own hydrogen envelope as part of a strong stellar wind consisting of streaming charged particles. The binary interaction model where a companion star is present is gaining traction because astronomers realize that at least 70 percent of massive stars are members of double-star systems. We’re finding that it is hard to form all the Wolf-Rayet stars we observe by the traditional wind mechanism, because mass loss isn’t as strong as we used to think. Said co-author Dr Nathan Smith. Mass exchange in binary systems seems to be vital to account for Wolf-Rayet stars and the supernovae they make, and catching binary stars in this short-lived phase will help us understand this process. What evolutionary path the star will take is uncertain, but it will definitely not be boring. Nasty 1 could evolve into another Eta Carinae-type system. To make that transformation, the mass-gaining companion star could experience a giant eruption because of some instability related to the acquiring of matter from the newly formed Wolf-Rayet. Or, the Wolf-Rayet could explode as a supernova. A stellar merger is another potential outcome, depending on the orbital evolution of the system. The future could be full of all kinds of exotic possibilities depending on whether it blows up or how long the mass transfer occurs, and how long it lives after the mass transfer ceases.